ABOVE PHOTO Pirates of the Caribbean: Battle for the Sunken Treasure. Courtesy Shanghai Disney Resort. The 5D Castle Theater at night. Courtesy Chimelong Ocean Kingdom. Rebecca Lam interviewed Rick Rothschild (FAR Out! Creative Direction), Arish Fyzee (Prana Studios) and Manfred Meier (Kraftwerk Living Technologies) about the project in issue #57 of InPark Magazine (“Kaka’s Great Adventure”). Located near the park entrance, the 5D Castle Theater introduces guests to the Chimelong Ocean Kingdom characters and helps set the stage for a day at the park. The 18-minute experience is impressive for the sheer size of its 134,000m², semi-circular main theater and its components: its vast 3D silver screen (18 x 88 meters), 2,119-speaker audio system with 119 subwoofers, high-resolution 3D projection (10344 x 2120 pixels) and sophisticated, 4D motion seats, pneumatically powered with what is said to be the first implementation of special effects armrests. Talent-wise, the 5D Castle Theater is the result of international collaboration between leading creatives and suppliers from around the globe. Installation teams from South Africa and Czechoslovakia complemented engineers and technicians from Germany and Spain, along with the lead creative and technical teams from North America, India and Austria. Rick Rothschild: Guests get the first of two story chapters in a five-minute video, presented on six large screens across the width of the preshow. On a mythical planet, a situation is causing turmoil to the polar region where penguins, polar bears, and other polar creatures live. A monster deep in the ocean is sucking up magma and warming the ocean, causing the polar cap to melt. The Ocean Genie, a magical young whale shark pixie, is sent off by the Penguin King to search for strong and capable heroes who have compassion, heart and bravery. He finds teenage tigers Kaka and Kiki and believes them to be the heroes he seeks. The preshow ends with the Ocean Genie leading them to start their Great Adventure. The main show tells the story of how the trio struggles to reach and finally defeat the deep-sea villain, the Magma Monster. After the climatic undersea battle is waged and the polar cap is saved, appearing from a dimensional cloud special effect a large animatronic parrot plane swoops out over the audience, flying out from above the 3D screen on a cable system and coming within three meters of the audience area, carrying Kaka, Kiki, and the Ocean Genie, who wave as they fly away in the “kiss goodbye” at the end of the show. Manfred Meier: The goal was to guarantee that every single visitor experiences the same overwhelming and stunning 5D adventure – no matter where they are placed within the auditorium. This can be technically daunting, given the large scale of everything in this project. To meet these challenges, we developed special solutions particularly regarding the projection system and 4D motion seat special effects. One key piece of technical innovation is the newly developed special effects armrest, with the ability to precisely adjust wind, scents, water blast, strobe lights, LED lighting and so forth. We believe this new approach guarantees enhanced performance, especially for large theaters such as this one – better than having effects coming from the ceiling, railings or seat backs. The special effects armrest also features a unique seat occupancy sensor that makes it possible to deactivate unoccupied seat units – a real breakthrough in terms of efficient and sustainable operation. The screen literally curves around the theater. That brought up the challenge of finding a way to view and edit the wraparound media. One of the devices we used for visualization was the Oculus Rift 360 virtual reality system. Slideboarding uses a specialized board with technology embedded within. Courtesy WhiteWater. Martin Palicki wrote about how WhiteWater conceived and developed Slideboarding (InPark Magazine issue #59). Slideboarding takes that gaming concept – the basic, competitive activity of slapping the waterslide joints – introduces technology, and riders become players. The concept is simple: Guests sit on a board equipped with red, green, blue and yellow buttons on the side handles. As they move down the waterslide, they pass under LED lights in four colors. Points are scored if they press the correct color button as they pass beneath the lighted target. Players receive feedback via small vibrations if they hit a target exactly. The system combines existing technology such as RFID sensors and readers and analytical tracking and it translates over to iOS platforms and Android platforms as well to create the Slideboarding experience. Perhaps surprisingly, combining water and electricity wasn’t the biggest challenge the team faced. Ensuring that Slideboarding was completely user-friendly for both the operators and guests was critical before deployment. That simplicity factor was key to making the attraction appealing for parks and for guests. Shanghai Disneyland comes alive at night, as evidenced in this photo looking at the iconic castle from Treasure Cove. Courtesy Shanghai Disney Resort. Disney’s newest park was named for three Thea Awards: one for Pirates of the Caribbean: Battle for the Sunken Treasure, another for Camp Discovery and a third for the entire park. This landmark development opened in 2016 and has been fodder for much conversation in the pages of InPark Magazine. 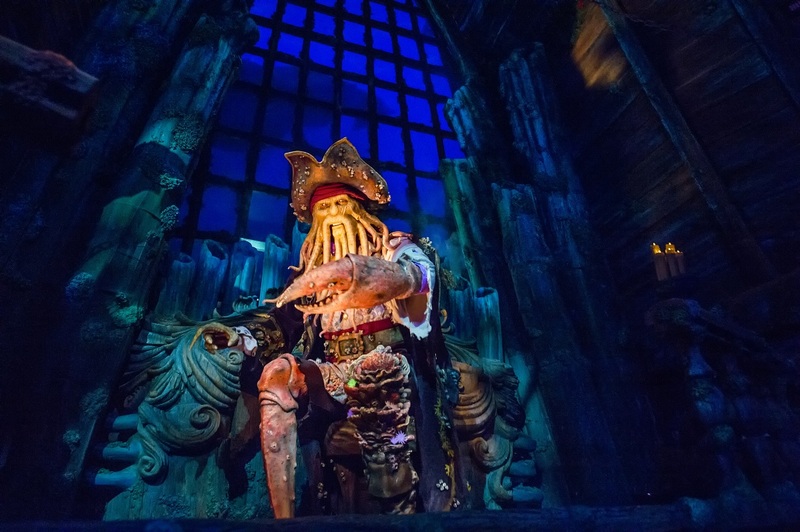 Gary Goddard, The Goddard Group: The Pirates ride at Shanghai Disneyland is spectacular. I went on the ride, then rode it again right away, and then scheduled another visit to the park to ride it a third time. It’s an excellently designed attraction. The big beats of that whole park are great and well thought out. Mr. Yue Feng, Shanghai Happy Valley General Manager and Marketing Director: History indicates that where there are Disney parks, other theme parks have also been successful, like in Orlando, Hong Kong, Japan, and Los Angeles. Disney and Universal opening in China means all the theme parks in China will need to update their scale and service, so during the next few years there will be a quality increase in theme parks in China. So it’s very bright for the future of theme parks. Dave Cobb, Thinkwell Group: I rode it eight times, if that’s any indication. It’s really wonderful. The reveal of the launch in the preshow is one of the best gags I’ve ever seen. The vehicles are gorgeous, and respond to your touch as you pull down the handles, “rezzing” from dark blue to white as you “activate” the safety restraint. The outside portion is so gorgeous at night. The onboard soundtrack brings the ride vehicle to life. And the indoor “game grid” section is so visually stunning. My only complaint is that it’s a little short! I’ve heard fans complain about the outdoor segment. Look, I’m the ultimate TRON fan, and I had my doubts. But, how they treat it – as an energy grid that keeps the vehicles rezzed while they’re outside – is gorgeous and clever, even without an on-the-nose narrative story explanation. Plus, there’s actually precedence for it in Legacy, because Quorra is rezzed outside of the grid into the physical world at the end of the film. It’s a bit like complaining that there wasn’t a 14-passenger LightCycle train in the movies – you have to make certain allowances for a high-capacity theme park attraction. Having it go outside is cool, and that’s good enough for me. Your mileage may vary. I was really blown away by the minimalism of the load station – it really felt like I’d stepped onto the virtual set of the movie’s game grid. Ken Saba, media producer/editor: In 1998 at Walt Disney Imagineering, during a semester off while I was working as an assistant editor, the late Tom Wright, who was in charge of film distribution, told me about this great project coming up and encouraged me to stick around for it. However, I was partway through getting my degree at the Art Center College of Design in Pasadena, and had to go back so as not to lose my placement. It was a tough decision. I remember telling Tom, “I’m going to kick myself for this.” The project was Soarin’ Over California. I would have been assistant editor. But there I was, 18 years later, the editor on Soarin’ Around the World. If it doesn’t happen now, it’s gonna happen later! Life is a funny thing. I’m glad I did it this way – I’m a different person now than I was then, and came in with the experience and ability to be the one and only editor on the project, working with the highest caliber people. It was a humbling experience. There are days when I’m in awe, and can’t believe I get to do this. Martin Palicki, InPark publisher: Everyone is abuzz over all the benefits Disney’s entry into mainland China will bring to the industry. While we collectively are most impressed with and tend to focus on the attractions found in parks, the real industry story is in the retail. Disney is in China because it believes (with great amounts of research to back it up) that Chinese consumers are interested in and able to buy Disney products. Disney’s presence in that market is a clear sign that what everyone has been talking about (a rising Chinese middle class with disposable income) is very real. Rebecca and Peter Chernack. Courtesy Rebecca Chernack. This year, the TEA Distinguished Service Honoree is Peter Chernack, and the award is being renamed in his honor and will be formally presented at the Thea Awards Gala. Joe Kleiman, InPark News Editor: If I were to describe Peter in a single word – it would be “space.” From the Space Quest Casino and the Kennedy Space Center Visitor Complex to retail space and public space, he was a pioneer in experiential design. He would also make the space for others – like me – interested in not only what he, as an individual, did, but the accomplishments of the themed entertainment industry as a whole. I first met Peter in my late 20s during a meeting of the Large Format Cinema Association, at the point when I was just starting my career in the attractions industry. He was there to discuss the design of the Space Quest Casino at the Las Vegas Hilton, which spatially and thematically linked the adjacent traditional casino on one side with Star Trek: The Experience on the other. After the presentation, I approached him with a few questions and he sat with me for close to an hour going into even more detail on the project. He gave me his card and told me not to hesitate on contacting him if I wanted to discuss, well, anything. He loved to share and he wasn’t mired in corporate censorship. As the years progressed, I took him up on the offer, calling a few times when I was managing IMAX theaters to ask his advice on preshow programming.